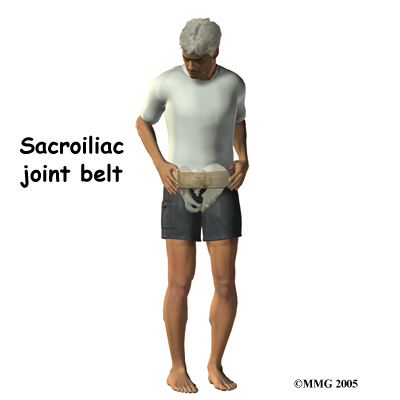 Welcome to Purposed Physical Therapy’s guide to sacroiliac joint dysfunction. 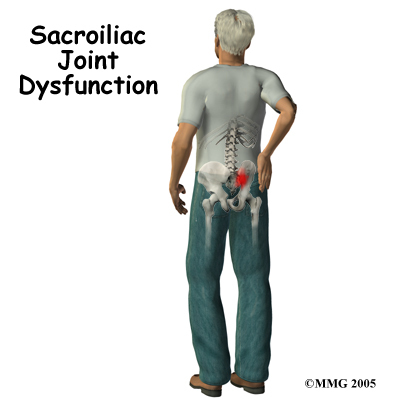 A painful Sacroiliac (SI) joint is one of the more common causes of mechanical low back pain. A ‘dysfunction’ of the SI joint is a term that is used to describe the pain associated with this joint because it is often still unclear why this joint becomes painful and leads to low back pain. Most people who suffer from this problem can reduce the pain with Physical Therapy treatment and manage the problem. If you have SI pain and live in Greenville-Spartanburg SC, then call the rehab experts at Purposed Physical Therapy, Greenville SC at (864) 881-1712! Like, comment, follow, tag, and share if you have, or you know someone who has, SI pain or pathology. What part of the back is involved? At the lower end of the spine, just below the lumbar spine lies the sacrum. The sacrum is a triangular shaped bone that is actually formed by the fusion of several vertebrae during development. The SI joint sits between the sacrum and the iliac bone (thus the name “sacroiliac” joint). On many patients you can identify these joints from the outside as two small dimples on each side of the lower back at the belt line. The SI joint is one of the larger joints in the body. The surface of the joint is wavy and fits together similar to the way Lego® pieces fit together. Very little motion occurs in the SI joint compared to most other joints. The motion that does occur is a combination of sliding, tilting and rotation. The most that the joint moves in sliding is probably only a couple of millimeters, and may tilt and rotate two or three degrees. Several large, very strong ligaments hold the SI joint together. 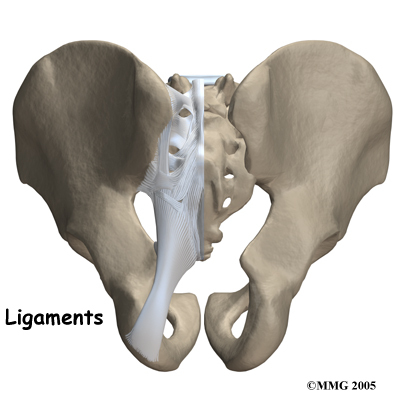 The strongest ligaments are in the back of the joint outside of the pelvis. The pelvis is a ring shape so these ligaments work somewhat like the hoops that hold a barrel together. The joint shape and the ligaments are one component in keeping the joint stable; the other component is the force of the muscles. If the ligaments are torn, the pelvis can become unstable. This sometimes happens when a fracture of the pelvis occurs and the ligaments are also damaged. In most cases of injury to this joint, however, these ligaments are so strong that they are not completely torn unless a great amount of force is involved, such as in motor vehicle accidents. The SI joint does not move a large amount in adults, but during pregnancy this can change. During the end of pregnancy, as delivery nears, the hormones that are produced cause the SI joint to relax. This relaxation of the ligaments allows the pelvis to be more flexible so that birthing can occur more easily. Multiple pregnancies, which increase the amount of overall time that the joint is acting in a more flexible way, seem to increase the amount of arthritis that forms in the joint later in life. It should be highlighted again that in comparison to other joints in the body, such as the shoulders or hips, ‘excess’ movements in the SI joint are still relatively very small and are difficult or impossible for you to feel yourself. 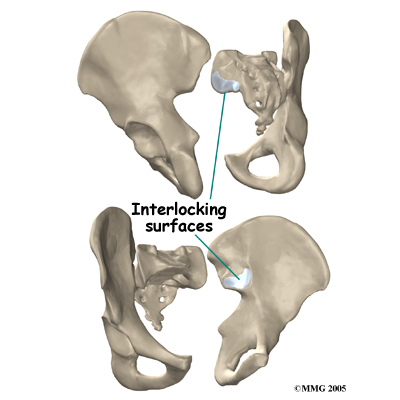 It appears that the primary function of the SI joint is to be a shock absorber, and to provide just enough motion and flexibility to lessen the stress on the pelvis, trunk, and spine. In addition, the motion at the SI joint functions in harmony with the biomechanical motion in the lower extremities during activities such as walking and running in order to transfer the impact load and to lessen the overall stress received by the body during these activities. There are many different causes of SI joint pain. As mentioned, pregnancy may be a factor in the development of SI joint problems both at the time of pregnancy, but also later in life. If a person has one leg that is shorter that the other, the abnormal alignment may end up causing SI joint pain and problems. Stiff SI joints may cause pain depending on the activity that one is trying to undertake. An ankylosed SI joint, which is a joint that becomes fused due to disease and therefore doesn’t move at all, may do the same. Traumatic events such as motor vehicle accidents, falls, or jarring events particularly onto one leg or one side of the buttocks can also cause SI joint pain. One common pattern of injury from a motor vehicle accident occurs when the driver places one foot on the brake before a collision. 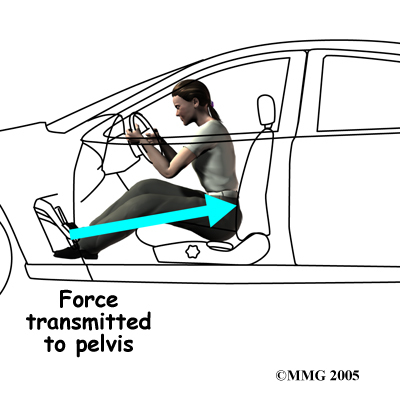 The impact through the foot on the brake is transmitted to the pelvis causing a twisting motion to one side of the pelvis. This can injure the SI joint on that side resulting in pain. A similar mechanism occurs with a fall onto one buttock or onto one leg, such as stepping into a deep hole or unknowingly off of a large curb. Again, the force through one side of the body, which causes a relative twisting motion to the pelvis, can injure the ligaments around the SI joint. When ligaments are injured or if they are lax due to hormonal changes (pregnancy) this decreases the stability of the SI joint. As this joint is normally a very stable joint, and requires stability to function, too much relative movement in the joint can cause significant pain and problems. The increased stretching of the abdominal muscles in pregnancy adds to the decreased stability of the joint as the muscles are unable to add as much force to compress the joint. Other than the role the joint plays in pregnancy, it does not appear that having large amounts of motion are paramount to the functioning of the joint in everyday activities. In fact, as stated, relatively large amounts of motion at this joint often cause pain, as many pregnant women discover. Generally the joint functions at its optimum when it is stable. Small amounts of relative motion in the SI joint are needed, however, in order for the pelvis to function properly and without pain. The older one gets, the more likely it is that the joint becomes completely fused (ankylosed) such that the joint does not move at all. Unfortunately, this situation of no movement, or reduced movement, can also cause pain in the area. Decreased motion at this joint can also occur overtime as a result of a biomechanical change in how you use your lower extremities. These change can occur due to previous injuries sustained in the lower extremities, such as fractures or sprains, that overtime, cause you to use your legs, back and pelvis differently, and as a result affect how your SI joint moves and functions. In many cases of SI joint pain, however, an exact cause or event leading to the condition cannot be pinpointed. In these cases, your Physical Therapist at Purposed Physical Therapy will determine, through a thorough history of your injury and physical examination, if the SI joint is the source of your pain, and if so, whether it is perhaps too stiff or too mobile. The SI joint is a synovial joint, similar to most other joints such as the knee, hip and shoulder. 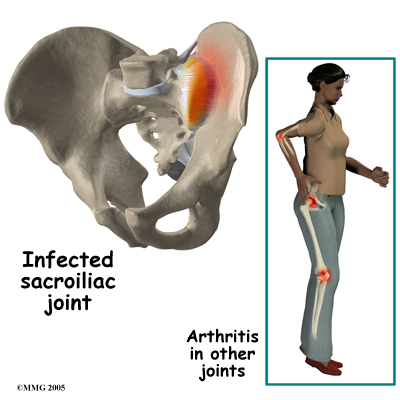 Due to it being a synovial joint, different types of arthritis that can affect the other joints of the body can also affect the sacroiliac joint. This includes rheumatic conditions such as rheumatic arthritis, gout and psoriasis. The SI joint can be infected when bacteria that travel in the blood settle in the joint causing a condition called septic arthritis. This is perhaps the most worrisome possible cause of SI joint pain and may well require surgery to drain the infection. What does this condition feel like? Most commonly the pain from an SI joint dysfunction is either directly over the SI joint itself or may radiate pain lower down into the buttocks. The pain may affect one side or both SI joints. Most times the pain from an irritable SI joint remains well above the knee, but in a few cases it can radiate down the leg all the way to the foot and may be confused with a herniated disc of the lumbar spine. The pain may also radiate into the groin area. People often feel muscle spasm or tightness in one or both of their buttocks muscles when the SI joint is affected. Problems with the SI joint may make sitting difficult. Pain in one SI joint may cause a person to sit with that buttock tilted up as it is often uncomfortable to sit flat in a chair. Walking can also be very painful depending on the degree of irritability of the joint and whether or not the joint is considered to have too much movement or is deemed stiff. Increased motion at the joint, such as during pregnancy, can be a particularly debilitating problem which makes activities such as going up or down stairs, standing on one leg, putting on your shoes and socks, or getting in and out of a car difficult. Turning over in bed is also particularly difficult when the SI joint moves more than normal. The history and physical examination are the most important tools that health care professionals, including your Physical Therapist at Purposed Physical Therapy, will use to diagnose a problem with your SI joint. Your therapist will want to know exactly where your pain is, if it radiates anywhere, when and how it started, and what activities ease or aggravate your symptoms. You will be asked about any injuries you may have sustained in the past such as falls or motor vehicle accidents. Women will be asked about pregnancies and whether or not they had pain during that time. You will also be asked about any other medical problems you might have such as rheumatic arthritis or related conditions. Next your Physical Therapist will physically examine your low back, sacral area, and lower extremities. First they will look at your natural posture in sitting and standing. They will also want to watch you walk and may ask you to go up and down stairs, squat down, hop, or stand on one leg. They will also check the movements of your low back and SI joint when you bend forward, backwards, sideways, or twist. In addition they will also want to look at the specific movements of your SI joint in standing as you stand on one leg while you bring your knee to your chest or put your leg back behind you. Your therapist will palpate (touch), around your painful area as well as many areas in your back, buttocks, and possibly your groin to determine which areas are causing most of the issue. The next part of the physical assessment will include your therapist performing some special movement tests to confirm the diagnosis of SI joint pain and to rule out pain coming from other areas in your back, such as the lumbar discs. These tests may involve pushing on your SI joints, your back, your hips, or even your knees in order to put pressure through the SI area. Many of these tests can provoke pain directly over the SI joint and assist both in diagnosing the source of the pain, and also in assessing the motion of the SI joint. Your Physical Therapist will also want to check the range of movement and strength in the joints and muscles of your low back and your hips. As discussed above, a biomechanical dysfunction from too stiff or too mobile joints or muscles that are not strong enough or too strong can add stress to the SI joint and cause pain. As mentioned above, a leg length discrepancy can do the same, so this will also be measured. Finally, your therapist will also assess your skin sensation, muscle strength, and reflexes in order to rule out your pain coming from areas other than the SI joint, such as a lumbar disc. Physical Therapy at Purposed Physical Therapy can be very useful for patients with SI joint pain. Your Physical Therapist will assess your SI joint dysfunction and determine how much of your pain is coming directly from this joint. They will then determine how well the joint is moving. The joint can be moving well, or there can be too much movement (hypermobile) or not enough movement (hypomobile.) Your individual Physical Therapy treatment will be determined according to these findings. Regardless of whether your SI joint pain is determined to come from a hyper or a hypomobility, your therapist may use heat, ice, or electrical modalities such as ultrasound or interferential current to help decrease your pain initially. They may also massage around the back, buttocks, and hip areas to also provide relief by relaxing tight muscles that could be pulling in the area of the SI joint. In addition, your Physical Therapist will ask you to limit or modify those activities, if possible, that irritate your SI pain. A short period of resting from these activities can help to calm the an irritated joint. When movement of a joint is limited, encouraging more motion can ease the pain. If you don't have full range of motion, your therapist has several methods to help you assist in increasing the movement at your SI joint. These methods may include using joint mobilizations or manipulations, performing passive stretching, and massaging any tight muscles. Stretches and strengthening exercises as part of a home program will also be given as they can assist to help mobilize your own stiff SI joint. These exercises may be targeted at your SI joint directly, but will also include exercises for your low back, abdominals and core area, buttocks and hips, groin, and the front and back of your thighs. These areas immediately around the SI joint are crucial in supporting the pelvis and the joint itself. Having a stiff low back or stiff hip in particular can significantly increase the stress put through your SI joints, so improving the mobility in these areas will certainly be focused on. Maintaining a strong core muscular area is also particularly important in easing the discomfort that comes from SI joint pain, so exercises for this area will also be focused on. If your SI joint is deemed to have too much relative mobility our Physical Therapy treatment is aimed at helping to stabilize the SI joint. Specific strengthening exercises will be taught in order to improve strength in muscles that support the SI joint such as certain muscles of the low back, the abdominal and core area, the groin, and the deep and superficial buttocks muscles. Developing muscular endurance in these areas is just as important as developing strength. The SI joint is put under stress during nearly every activity that you undertake, even sitting or rolling in bed, so the ability to support the joint’s alignment for long periods of time is crucial. Any deviation from correct biomechanics even for short periods can potentially put stress on the SI joint and cause discomfort, particularly if the joint is already irritable. Specific stretching exercises will also be prescribed in order to ease off the pull of tight muscles around the joint. Unfortunately, few muscles actually connect to both the sacrum and the pelvis and therefore although you strengthen the weak muscles, stabilizing the SI joint completely can be more difficult in comparison to stabilizing other joints. Your SI joint may continue to move relatively more than normal and cause you ongoing discomfort with certain activities or when your muscles get tired. To combat this overall increased motion and to aid in alignment your therapist may suggest that you use a SI belt to help stabilize the joint. An SI belt is worn over the SI joints and around the hip area to help compress the joint together in order to create increased stability. Wearing an SI belt can often ease pain during activity and allow you to exercise comfortably. Many pregnant women find these belts particularly helpful. Using tape on the SI joint area, hips, and low back can also help to ease some of your pain, so your therapist may try doing this either before suggesting a belt, or in conjunction with doing so. As with any injury or biomechanical dysfunction, maintaining one’s posture and alignment is very important. Despite whether your therapist determines that your SI joint has increased or decreased motion, they will be strict in encouraging you to maintain proper posturing and alignment at all times. Maintaining good posture can significantly decrease the stress put through the SI joints. By improving the endurance of the muscles that support the SI joint, you will be able to maintain your posture and alignment for longer periods of time, and lengthen the time frame between painful bouts of SI joint irritation. Anti-inflammatory medications, such as ibuprofen and naproxen, are commonly used to treat the pain and inflammation in the SI joint. Acetaminophen or paracetamol can be used to treat the pain, but it will not control the inflammation. If conservative treatment is unsuccessful, your doctor may suggest injections to the joint. 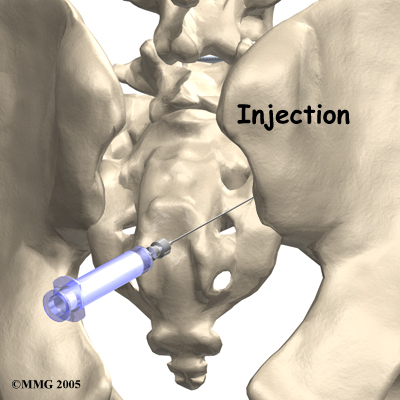 As described above, injections are used primarily to confirm that the pain is coming from the SI joint but they can also be useful in controlling the pain. A series of cortisone injections may be recommended to try to reduce the inflammation in and around the SI joint. Cortisone is a powerful anti-inflammatory medication that is commonly used to control pain from arthritis and inflammation. Other medications have been injected into the joint as well. A chemical called hyaluronic acid has been used for years to treat osteoarthritis of the knee. This chemical is thought to reduce pain due to its lubricating qualities and its ability to nourish the articular cartilage in the synovial joints. The true mechanism of action remains unknown, but it has been used with some success in the SI joint. All of these injections, unfortunately, are temporary and are expected to last several months at the most. 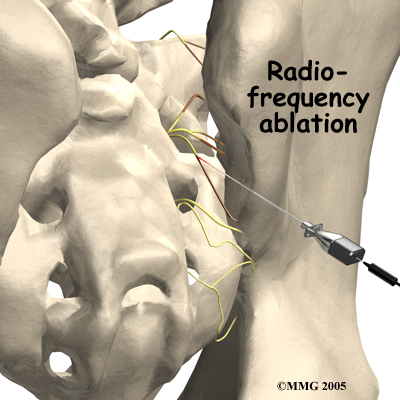 Another procedure that has been somewhat successful for chronic SI joint pain is called radiofrequency ablation. After a diagnostic injection has confirmed that the pain is coming from the SI joint, the small nerves that provide sensation to the joint can be "burned" with a special needle called a radiofrequency probe. In theory, this destroys any sensation coming from the joint, making the joint essentially numb. Unfortunately this procedure is not always successful. If it does help, it is temporary but can last for up to two years and can be repeated if needed. Surgery may be considered if other treatments don't work. Surgery consists of fusing the painful SI joint. 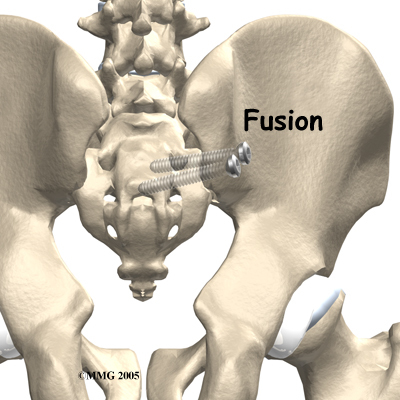 A fusion is an operation where the articular cartilage is removed from both ends of the bones forming the joint. The two bones are held together with plates and screws until the two bones grow together, or fuse, into one bone. This fusion stops any motion between the two bones and theoretically eliminates the pain from the joint. This is a big operation and unfortunately is not always successful at relieving the pain. The operation is not commonly performed and is reserved only for use when the pain is debilitating and all other attempts at conservative treatment have failed. You will normally need to wait at least six weeks before beginning rehabilitation at Purposed Physical Therapy after having SI joint fusion surgery. You should plan on attending therapy sessions for six to eight weeks but you can expect full recovery to take up to six months. The initial aim of treatment when you first begin Physical Therapy after SI joint fusion surgery will be to decrease or minimize any ongoing pain that you have from the surgical procedure itself. Your therapist may use ice, heat or electrical modalities to assist with your pain. They may also do massage on your back, buttocks, hips or any area down your entire leg in order to assist with pain and residual swelling. The goal of Physical Therapy after an SI joint fusion surgery is to maximize the overall biomechanical functioning of your hips, low back, abdominal and core area, pelvis, and entire lower limb and trunk area despite a fused SI joint. In order to do this, your Physical Therapist will prescribe exercises to stretch any tight muscles and strengthen any weak ones. They will also educate you on the most efficient way to hold your posture, and to perform your everyday activities in order to move safely and minimize stress on the healing SI joint. Once healed, focus will be turned towards ensuring you move well and without undue stress on your other joints as well, despite a fused SI joint. Ideally, you'll be able to resume most of your normal activities but they may need to be modified slightly. Your Physical Therapist will educate you on activities that may be considered unsafe, or have the potential to irritate your SI area or other joints. When you are well under way with your rehabilitation, regular visits to Purposed Physical Therapy will end. Your Physical Therapist will continue to be a resource, but you will be in charge of doing your exercises as part of an ongoing home program. Generally rehabilitation at Purposed Physical Therapy after surgery for SI joint fusion goes extremely well and you can eventually return without difficulties to the activities you enjoy participating in. If, however, your pain is lasting longer that your therapist thinks it should or you are not progressing as rapidly as your therapist would expect, they will ask you to follow up with your surgeon to ensure that there are no complicating factors from the surgery that are impeding rehabilitation.